Dr. David Jernigan, Biologix Center: Shattered by illness! PTSD and CTSD in Lyme disease and Chronic Illness. Shattered by illness! PTSD and CTSD in Lyme disease and Chronic Illness. When a person's life and dreams are shattered due to chronic illness it almost always sets up a Chronic Traumatic Stress Disorder (CTSD). Much like our wounded warriors and others who have suffered through prolonged stressful events and have the predictable physical and emotional problems we know as PTSD, Post Traumatic Stress Disorder, people who have been through the life devastation brought on by illnesses, such as Lyme disease, cancer, multiple chemical sensitivity, and the wide array of other degenerative illnesses also suffer predictable physical and emotional consequences of the severe trauma from the devastation of their life from their illness. A person with CTSD does not have to look like the woman pictured with this article. They might look perfectly calm, cool, and collected. They might indeed have no overt emotional issues associated with their CTSD, yet the stress placed upon their body by the illness and the treatments is still causing predictable functional problems from adrenal fatigue that can drag the person down for years after the illness is resolved. At the Hansa Center for Optimum health, our doctors have treated tens of thousands of chronically ill people. I would say that the majority of the people had received their diagnosis elsewhere and their previous doctors had just pounded their body with antibiotics, in the case of Lyme disease, and hammered their body with various prescriptions, with little thought given to supporting the rest of the body, and definitely no thought of how these medicines act as a stressor to the body, and the illness itself is a physical and emotional stressor, and life issues while sick is a stressor...all of which drag down the primary stress-regulating glands of the body...the adrenal glands. Just like what we are seeing with our returning wounded military soldiers, the fighting is over, the stressful war is behind them, yet their bodies and minds are ravaged by the effects of chronic stress. In chronic illness, so much time and energy...and money...is spent in efforts to "kill the bugs" and to detoxify the body, chasing one symptom after another. One of the most important issues to address in people who have had prolonged infections is to rebuild and heal the tissues that have been damaged by these infections. Infections are often like having termites damaging the wood in your house. You can use toxic chemicals to kill the bugs, but even when successful, these toxic substances are now lodged in your house, and they do nothing to correct the wood damage the termites caused. Any stiff wind will damage your house further...you are more susceptible and sensitive to challenges. Very often because a person had infections, such as the ones associated with Lyme disease, the person has many symptoms that have been increasing for years. The myth they were sold by their doctor and the Lyme disease community was that they would be well when every bacteria was killed. Like the termite analogy, often the assumption is that the body can heal itself after all the toxic drugs and die-off toxins. The reality is that almost every system of the body has been damaged by the illness and the treatments and killing the bugs and detoxifying the die-off are just half of the healing process for those who had the illness for years. Every case of CTSD and PTSD has adrenal problems that must be addressed before the person can regain the functional integrity and optimum health they seek. If you feel that you have internal vibration in your body, like you cannot get your hormones balanced, if you feel your are not the same even after your doctor proclaimed you "cured," if you have no energy, no motivation, no ability to deal with stressful situations, if you are suffering from sleeplessness at night and fatigue all day...ask your doctor to do a saliva cortisol and DHEA test at the least. My favorite lab for this testing is www.diagnostechs.com. The best is to do a 24 hour saliva cortisol test where you collect four saliva samples that day, and test also the DHEA level. 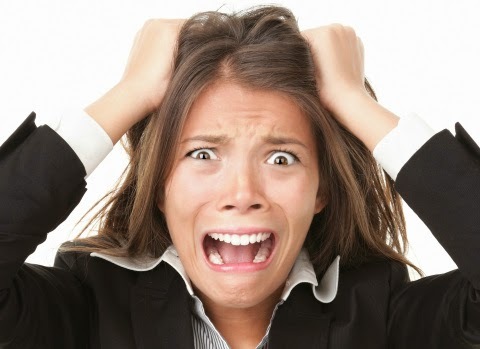 This is what your test result will look like with adrenal fatigue. The adrenal glands produce both DHEA and Cortisol. In this chart you can see that both are very low. This saliva test is done at home and you would mail the test kit back to the lab with the provided box and mailing label. 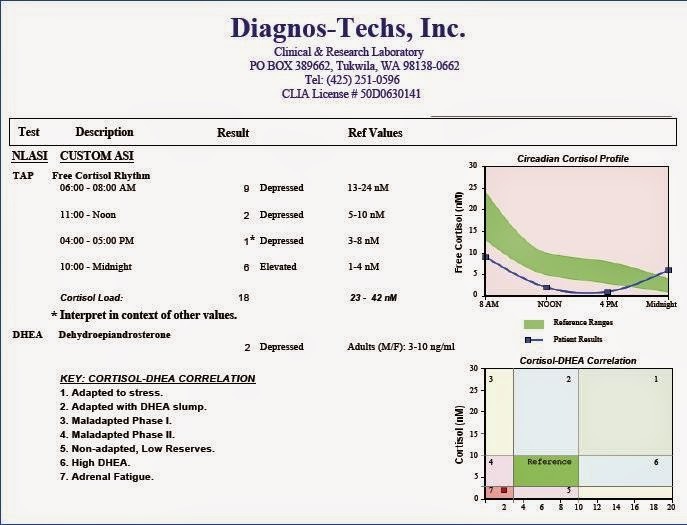 Below is what the test results would look like for someone suffering from adrenal fatigue, due to CTSD or PTSD. The doctors at the Hansa Center have used this test for many years to help determine not just adrenal function, but we can add on other tests to your saliva collection that will show what is going on at the cellular level regarding all of the male and female hormones and even gluten, casein, soy, egg allergies. You are your own best health advocate. If you doctor has not done this testing then ask him/her to order it for you. Your doctor cannot fix what they don't know is messed up! For over 20 years the Hansa Center for Optimum Health, in Wichita, Kansas has specialized in the restoration of health for people with previously unresponsive and chronic illnesses of virtually all types. Over 85% of people come from other states and countries. If you have done everything you and your doctor know to do and are still struggling, contact our wonderful Patient Care Coordinator, Kara, at patientcare@hansacenter.com, for information on the exciting new treatments we have developed at the Hansa Center for Optimum Health. For additional info, visit our website at www.HansaCenter.com. This article is for educational purposes. Before implementing any supplements/remedies always consult with your healthcare professional. Due to the complexity of the human condition there remains the possibility of symptoms getting worse. Again, discuss the ideas presented here with your health care professional before beginning, and stop, or get support, if your condition worsens. This information is not intended to treat, cure, diagnose, or mitigate any disease or illness, and has not been evaluated by the FDA. The Hansa Center does not treat named diseases, but seeks to restore the body's optimum structural and functional integrity so that the body can rapidly heal itself. *Due to the exhaustive time spent per day with each patient, and poor repayment history of insurance companies, we unfortunately cannot accept insurance assignment. We do participate in Care Credit, and accept all major credit cards. We will gladly accept insurance when our elected officials revamp the health insurance industry to cover all results-based care. We encourage you to vote with this in mind. Please call 316-686-5900 ext. 1, for current pricing for our economically-priced, All-inclusive 2-3 weeks intensive packages of care. You have an open invitation to create an international clearing house here on my amazing property! Good to know about the topic on psychological stages of chronic. You have explained it broadly and nicely. Thanks and keep posting more.